Jessie Garber, in a screen grab from her Indiegogo pitch video. The race is on: Jessie Garber wants to reach young girls before the princesses do. The Illinois State senior is writing her own children’s book about a female president, so that her young readers can see all that they can become—beyond princesses—at an early age. And this isn’t just a pie-in-the-sky idea; Garber has already lined up almost $7,000 to edit, design, and print her Madam President book through a creative online fundraising campaign that ends Monday night. Garber was inspired, in part, by GoldieBlox, a toy company that aims to inspire young girls to become engineers. As an English and political science major, she wondered why there weren’t any similarly aspirational children’s books about a grown-up female president balancing her job and family. “I thought I could combine my two majors and write a children’s book that inspires girls to go into politics, by showing them what they can be. That there can be a woman president, and if we visualize that for them—and show them the picture—we can get in their minds before princesses do. 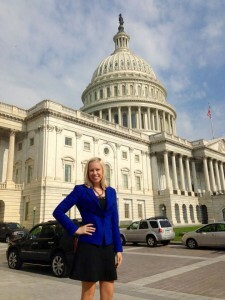 Garber in front of the U.S. Capitol during her recent internship in Washington, D.C.
“We’d show them that it’s not about what they wear. It’s about what they think, how they treat other people, and how they serve others,” said Garber, who interned in Washington, D.C., last summer. Garber’s Madam President pitch has generated $6,820 in pledged contributions from more than 180 people on the crowdfunding website Indiegogo. She’s already beat her $4,631 goal. She’s written the manuscript for the book, which depicts a day in the life of a female president as she makes important decisions, attends meetings, and travels the U.S. It shows her commanding the troops, as well as ending the day at a movie night with her family, including the First Gentleman. To reach that goal, the Orland Hills native orchestrated a social media and email blitz, getting help from her friends along the way. Even the Geena Davis Institute on Gender in Media shared it on Facebook. And when she hit $4,631? “Tears of joy. I was so excited, because it was sort of scary to jump and know you might fall,” she said. This wasn’t Garber’s first online effort that’s generated real buzz. Last year, Garber was featured on STATEside after creating Actual Sorority Move (ASM) to counteract stereotypes about Greek life. She’s since handed off ASM, which is still active on Twitter with more than 4,000 followers. Garber, a student leader and Bone Scholar at Illinois State, is set to graduate in May. She plans to live and work in the Chicago area for one year before starting graduate school in fall 2015.